Can someone install something on my computer when it's not logged in? Before I raise heck in the house, would you please answer a question? We have several computers in our home. Recently, I have seen "Spy PC 7.0 Quick Start Guide" in the home. I don't mind if the owner of this booklet uses it on his/her machine, but not on anyone else. Can this be installed on other personal computers (which are usually password locked)? The short answer is yes, absolutely. I think you're right to be concerned. I also think there's an exceptionally important lesson here for everyone. Continue Reading: Can someone install something on my computer when it's not logged in? Do you wish it were easy to downgrade from Windows 8 to Windows 7 or want to keep Outlook Express emails when you upgrade? Is it better to never show images in emails or stay away from cash machines. Is a big email list bouncing too often? All that and more in this Answercast from Ask Leo! Continue reading: How do I access email stored in Outlook Express on Windows 8? How do I downgrade from Windows 8 to Windows 7? Downgrading isn't as easy as you might think. Simple, perhaps, but not even close to easy. So let's look at an alternative. Continue reading: How do I downgrade from Windows 8 to Windows 7? Continue reading: Is it OK to not click on the show images button in email? Is an external hard drive better for backing up than DVDs? DVDs can be a clumsy solution for backing up - especially if you want to take a full system image. It's much better to go for an external hard drive. Continue reading: Is an external hard drive better for backing up than DVDs? You're not a spammer, I know that - but you're acting like a spammer. And there's your problem. Continue reading: Why does email I send to a large contact list bounce so often? 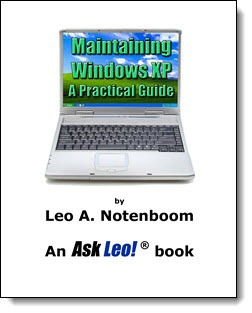 Continue reading: What about all those cash machines running Windows XP? My very first computer virus back on Windows 98 was from a disc that a friend gave me. I wasn't on the Internet yet but he was so he downloaded a media player for me to try out. Unbeknownst to him, it had the Chernobyl virus on it. I learned early on that even a "disconnected" computer isn't really disconnected from threats. Perhaps you could put an article together to point us in the direction of a replacement ? We know Windows 8 is only touchscreen & 7 has had some poor reviews so what do we go for. Does it mean a new PC as well ? Windows 8 is NOT NOT NOT ONLY TOUCHSCREEN. I'm using it right now on my 5 year old desktop NON touchscreen machine. It's a fine OS, and I actually recommend it. OK LEO. It is not fair to legendary Microsoft by sweepingly writing that Windows 8/8.1 is a very bad OS. It depends what you mean is bad. I know that Windows 8 is considered 'more secure' and 'faster '- as MS always says about each new OS. It is probably true. I have in my work with IT and private life been running every version of Microsoft OS since MS-DOS 1.27 when I bought the first 'portable' PC-clone Columbia in 1983. Each new version of MS-DOS/Windows since then has been an improvement and a vast positive step forward relative the foregoing version. I even liked Window Me but the clumsy Windows Vista was an exception. I hope you can accept that I call Windows 8 as a messy and 'unclean' operation system with a lot of redundant ballast that you don't need and don't want in a desktop operating system. I think Microsoft did an impressing job in their effort to do the impossible - to join two incompatible worlds into one. Of course I have installed Start 8 to reduce my pain when I have to run Windows 8. In the future I hope that MS will follow the advice in Windows RED when they design Windows 9. "I hope you can accept that I call Windows 8 as a messy and 'unclean' operation system with a lot of redundant ballast that you don't need and don't want in a desktop operating system." No, not really - unless you can say the same thing about Windows 7 that is. In my opinion Windows 8 has only marginally more fluff than Windows 7, and as I've said multiple times - with something like Classic Shell installed it's difficult to tell the difference between the two. I really, really get that you don't like the tiled interface, but you rarely have to use it. The tiled interface probably only adds as much code bloat as Aero did. Once you get past the tiled interface Windows 8 is, essentially, Windows 7. Recently, I've been helping a friend who's a local small business owner; it's opened my eyes to some of the things that are going on in the online review business. You know the sites – the ones where you provide reviews of your local restaurants, services, and other establishments, and then others use those reviews to decide where to have lunch, get their car serviced, or hire someone to repair their roof. In fact, online reviews are critical in many venues, including my own (which I'll get to in a minute). The problem is that online reviews can be gamed in both directions by all sorts of interested parties. Worse, the solutions to stop reviewers from gaming the results are often worse than the problem that they're attempting to solve.